Discovering the Naturalist Intelligence: Science in the School Yard by Jenna Glock, et al. 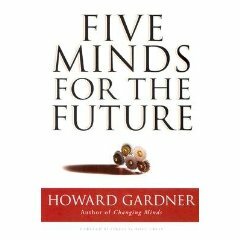 This book is based on Gardner’s work with mutliple intelligences. It proposes that one of the intelligences is for nature and the natural sciences. The book presents solid, interesting lessons for cultivating the Naturalist Intelligence. Math in the Garden: Hands-on Activities That Bring Math to Life by Jennifer White, et al. This book contains many wonderful math activities that are garden based. The areas of math covered are number, operations, algebra, measurements, geometry and data analysis. All the activities are graded for ages 5 through 13. Excellent activities that are well structured. Howard Gardner is a professor of cognition and education at the Harvard Graduate School of Education. He’s also the author of over 20 books and several hundred scholarly articles. Gardner is probably best known in educational circles for his theory of multiple intelligences, which is a critique of the notion that there exists but a single human intelligence that can be assessed by standard psychometric instruments. This is a great book! Thank you for recommending it to my teacher friends. Could you recommend more books please.